Our mission is to empower those who have been labor trafficked and commercially sexually exploited by providing access to free comprehensive legal services, advocacy and specialized trainings to help transform survivors’ lives. 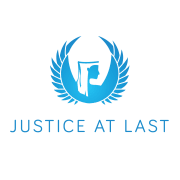 Justice At Last’s vision is for survivors of human trafficking to define justice in their terms, obtain justice, embrace justice and thrive through justice. JUSTICE AT LAST accepts donations. Donate Now. Would you recommend JUSTICE AT LAST?